DJ Harvey’s future was in doubt heading into the season and Notre Dame head coach Mike Brey was very cautious as practices began in October. The 6-foot-6, 225-pounder was coming off microfracture knee surgery and no one knew how much he could contribute this season. The sophomore guard has answered the call and probably even more than most thought he could. Harvey is averaging 11.7 points and 4.3 rebounds per game, but he knows there is still work to be done to put the injury in the rearview. The Bowie (Md.) native played in six ACC games last season before the injury, so while he has experience, Harvey is also still learning to navigate the conference schedule. 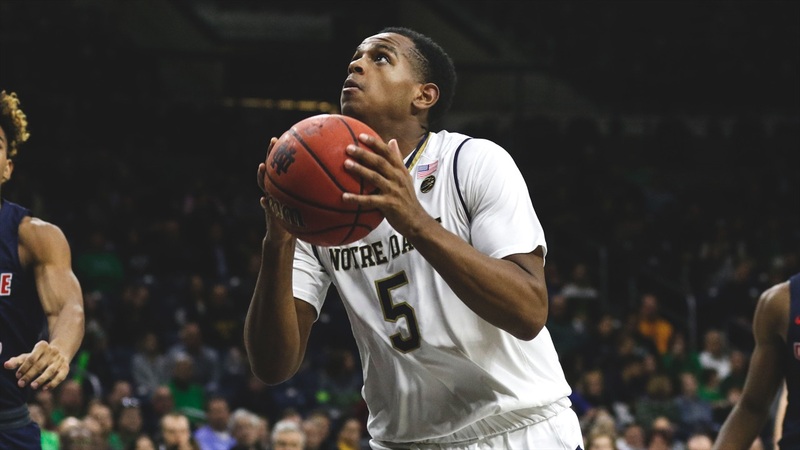 Following the loss at North Carolina on Tuesday, Brey and his team feel the Irish are close to turning the corner. Notre Dame and Harvey have also felt the love and support from their head coach. Brey has taken the burden of the up and down play and hasn’t put the blame on his team. “He’s been doing everything and instilling confidence in us,” said Harvey. “He’s always behind us 110%. He’s always confident in our abilities on the court. He’s always putting it on himself and taking the blame or responsibility for the tough losses. Harvey can be one of those who can take his game to the next level as he can be more aggressive on the offensive end. But it also comes from gaining confidence in his knee and working on consistency in practice. Notre Dame will now enter a gauntlet of tough games to end January. The good news is the Irish will only play Georgia Tech on the road, but the bad news is NC State (17), Virginia (4) and Duke (1) all come to Purcell Pavilion. The Irish will get a chance to pull to 2-3 in the ACC on Saturday at 2:00 p.m. as NC State comes to South Bend and Harvey is looking forward to playing a complete game.